As I recounted in my last post, the midwives arrived about 5 minutes after my daughter birthed in a planned unassisted birth. She was cradled in my arms and I was still in the pool. I wanted to stay there as I had only just gotten in! The arrival of the midwives changed the atmosphere to one of a busy bus stop. Two arrived with a student midwife as I had said was ok in my birth notes. The more experienced midwife, going by her age and demeanor, began to be busy herself with asking me questions and make notes regarding the birth. I remember being asked what time labour started, when did my water break and in retrospect, my living room now took on the atmosphere of a busy room. Not helped by having the main lights blazing, lighting it up like a supermarket. Then we were waiting for the placenta. I did not want to get out of the pool. At first partly because I only in for 10 minutes now but also because I did not want to be touched by the midwives. I didn't want anyone prodding and poking me and I was wary that seeing I was not the most compliant of antenatal mothers that they may be suspecting that I deliberately waited to call them. I had a two or three strong contractions but then they died down. I realised that really warm water could cause this to happen but I still did not want to get out. The main midwife was sitting next to the pool, hovering, with the longest rubber gloves on, waiting for something it seemed. I found the gloves a little ludicrous as I recalled the gloves vets used on farm animalsl, and she didn't touch the water and asked me to fish out the blood clot that was in the water which disappointingly for me was not a placenta! My baby stayed in my arms quiet, peaceful sleeping or feeding. It seems farcical now but this is what my husband calls a 'Mexican Standoff'. They wary of me. Me wary of them. At some point someone had the good sense to turn down the lights. The student midwife took advantage of the situation and fell asleep in a chair. My friend, Fay, stayed quiet in the background. She recalls sweating like crazy because the pool turned the living room into a sauna but for me the water was perfect. Finally, I could feel the water temperature dropping and I had to make up my mind to come out of the pool. I asked by husband to come from upstairs where he had gone to put my older child to sleep to come and cut the cord and then I asked Fay to hold my new baby so that I could climb out the pool. This was my decision as being in the place I was, I was insistent that this 'bossy' midwife was not going to be the first person outside my family to touch my baby. After 2 hours with no placenta. The midwife announced stated quite firmly that if they don't use syntometrin and traction to remove the placenta then I would 'have to' go to hospital. For me that was it. The old hospital trigger made me acquiesce to what I think was a bullying way of getting me to concede to their policy. I hated being touched by her to do this. It is the one event that I would change. I would at that point told them to leave and I would have waited at home, alone in the quiet of my time. But also getting it over and done with won out and I endured traction and prodding by blocking my emotions. 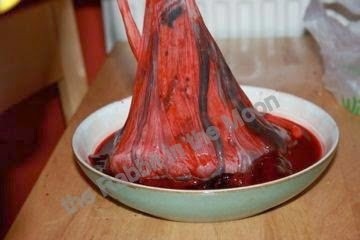 She looked my placenta over and then stated that it was very interesting and called the student over to look at it. Of course this my curiousity piqued and I wanted to know why. It turns out that it was a velamentous cord insertion placenta and she said that she had not seen one in years and that it was the best example she'd seen of one, even better than text books. So naturally I asked to keep it. Which I duly smelled, touched, and photographed as this wondrous thing with such power. But it was good to get her out of my house. They left at 8 am, handing me over to the community midwife, the team leader who told me that 'if they were busy I would have to come in'. She now praised me for having a 'fantastic' birth. In retrospect, I feel like the arrival of the midwives brought the hospital to my home. They wanted things done their way once they got there and it is hard to say 'no'. A year later, chatting to Fay who by then had a newborn of her own, asked my opinion of the midwives. I said one was very bossy. It was now that Fay told me that, sotto voce, she had said to her, "I can see who is in charge here." I do not know what or how I would have reacted at the time if I had heard that. For me ultimately I had a hands off second stage which was important to me. For days I felt like I was walking on a cushion of air. It was like winning Olympic Gold. Someone asked recently how do I feel about having an attended birth now, considering that I have had a healing birth and therapy for post traumatic stress disorder. Despite everything I have said, I am a powerful advocate of births attended by midwives as that is how most women relax for childbirth and how they feel safe for birth. For me, I have crossed the Rubicon. I don't know if I can ever go back to the other side. Breastmilk and the Pool, again.